The question of last week was ‘which celeb do you look like?’ Most of you girls think you look like JB! That’s awesome, JB is great! 42% of you guys look like JB! 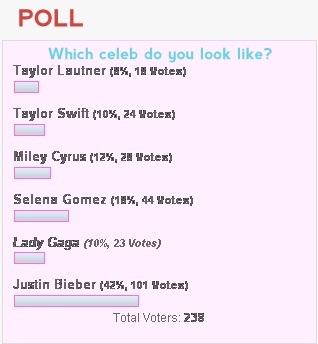 Second is Selena Gomez with 18% of all votes, so JB is the big number one! A close third is Miley Cyrus with 12% of the votes and Lady Gaga and Taylor Swift both have 10% of the votes. Only 8% of you all find that you look like Taylor Lautner, well I wish I would look like Taylor Lautner, he is a great person and so cute! JUSTIN BIEBER MEGUSTA TU MUSICA DE TU DISCO I MEGUSTARIA QUE MINIERAS ACER UN CORCIERTO EN VILADECAS. voce e um gato lindo gostoso e sinpatico te adoro beijos de sarah . aku suka bangetzz lo sma justin bieber aku fens berat dia. te kieroooooooooooooooooooooooooooooooooooooooooooooooooo…………………………………….. choooooooooooo no kamvies nuncaaaaaaaaaaaaaaa……………. justin a mi megustas te kiero mucho…………………………………………………………………………………………………‚ô•‚ô•‚ô•‚ô•‚ô•‚ô•‚ô•‚ô•…………………………………..